He’s known in Long Beach as the man with his name on the circa-1941 Billings Ace Hardware, but Doug Billings, 47, has a second vocation that few people have heard about — once a year, he travels to Belize as a volunteer cave surveyor and mapper. Billings, who returned last month from his latest trip to South America, said he feels like Indiana Jones as he and a team of cavers explore caverns that have never been seen by humans. 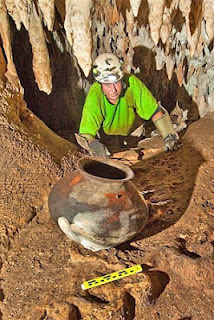 His team, armed with helmets, ropes, backpacks and machetes (to cut through the jungle), is responsible for mapping caves as well as recovering or taking inventory of archaeological (from Mayan pottery, petroglyphs and sacrificial tools) or biological findings (from human skeletons to new insect species). 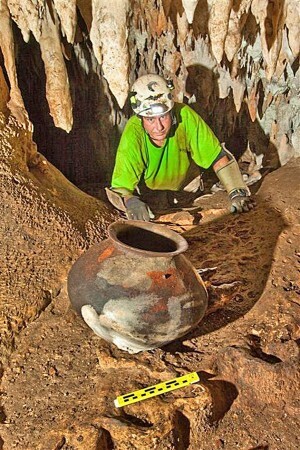 Because many cave systems in Belize were used by the Mayans as places of worship, Billings’ team regularly finds Mayan artifacts that have been sitting undisturbed for more than a thousand years. Exploring caves — starting with abandoned mines and caves near Joshua Tree — has been a passion for Billings since he was a teenager. As a teenager, he joined a caving club and said he started reading any book he could get his hands on at the library that had to do with caves. Additionally, he found government files at the library about geological studies. “I went to school for business, but I was doing my own, private homeschooling,” Billings said, adding that although he decided to take over his family’s hardware store business, he made caving his passion and hobby outside of work. Today, Billings has more than a decade of experience leading teams and drawing maps of cave systems in Belize, in addition to decades more experience exploring caves in North America. It’s tough work — requiring physical fitness, survival skills, the ability to rock climb, scuba diving knowledge, and courage in the face of darkness, heights and tight spaces. Billings said he has camped underground for five days at a time, has squeezed through crevasses he could barely fit through, been cave diving with crocodiles, and been to places inside the earth where the oxygen levels have dipped dangerously low. But he said caving isn’t about taking unnecessary risks for the sake of adventure. Billings said he doesn’t get scared inside caves, but he said everyone has reasonable fears or knowledge that if they fall, they are going to get hurt. And, he recalls being afraid once — even jumping out of the water and scaling a wall — after being bitten in the leg by an unknown creature with big teeth.